Did Your Food Plot Really Fail? Every year, hunters across the continent plant thousands of acres of food plots for deer. From ¼-acre “kill plots” to five-acre destination feeding fields, there are a wide range of plot sizes. But for the most part, food plots will average around one acre in size, give or take. For those with equipment like compact tractors and disc harrows, the size of the plots may be a little larger correlating with the easier and faster planting time. For those using ATVs or hand tools, plots may not be much more than ¼ to ½ acre. With all the sizes, there is a plethora of food plot plantings. From clover to oats, and soybeans to brassica, the choices for a food plot are nearly endless, especially when you consider food plot mixes. Every year, without fail, no matter the timing of planting, I consistently hear about food plot disappointments. From poor production to no production at all, sometimes it seems as if more food plots fail than succeed. There are lots of causes for this, from soil conditions to weather, but in all the food plot failures I have consulted for, the number one culprit is almost always deer. That’s right, too many deer. Whether that’s because you actually have too many deer for the property, planted a non-browse tolerant species, like soybean or cowpeas, or the plot was too small to handle the pressure of deer herd, they typically all lead to what one might call food plot failure. A failure is a failure right? I mean does it really matter why the food plot will not be producing for you to hunt over or feed your deer and turkeys? Absolutely! The fact is, we will always face weather conditions, like drought or flood, and there is not much we can do about that. If the issue is soil conditions, we can always look to amend through adding pH-raising elements like lime or bio-activated calcium, such as DeerGro. But one of the first gut reactions I make when I see a food plot fail is that over browsing by deer is the source cause. Many instantly think that they don’t have “that many deer” or “have other plots that grew,” which may be the case. But there is one simple way we can easily determine if deer are the cause, and it goes into action right after the seed is sown – a food plot cage. A food plot cage is an extremely simple tool that can tell you a whole lot about the food plot you just planted. Using a six-foot long by four-foot tall piece of grid panel, form a circle and lock into place with rings or wire. Attach to a t-post and establish in the dead center of the food plot. For larger plots you may want two of these. The cage will prevent browsing deer from getting inside and show what the true potential of the food plot, excluding deer pressure. Often it’s amazing how much damage deer can do to a food plot, especially smaller plots or those with plants not suited for heavy browsing, like soybeans or cowpeas. Not only will this show you how the plot should have grown, but during the hunting season can be an indicator of deer usage on a plot for a hot hunting spot. Although we like to think soil and/or weather is the immediate cause of plot failure, deer pressure is the number one cause of food plot failure in most of the whitetails’ range. 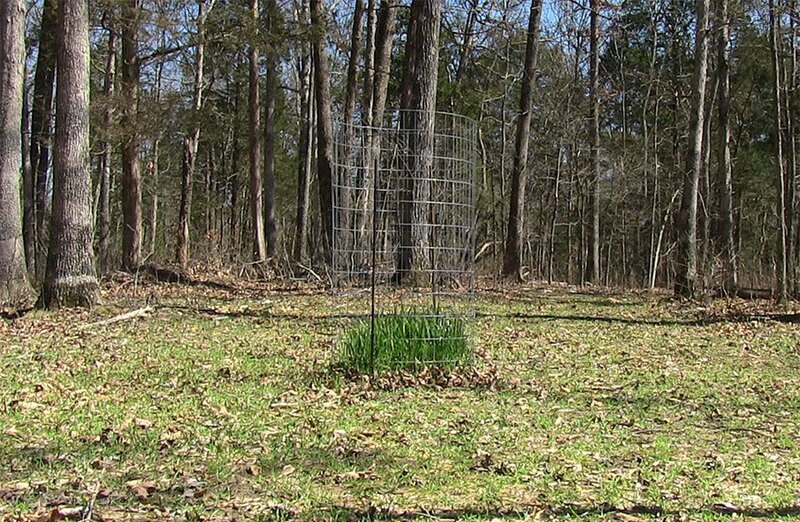 Installing a small food plot cage after planting can make a big difference in your reasoning.